In large bowl, dissolve yeast in warm water. (If you've just cooked the potatoes, use 1 1/2 cups of warm potato water.) Stir in potatoes, sugar, butter, salt, eggs and 3 cups of the flour. Beat with electric mixer on low speed until smooth. Beat on medium speed 1 minute, scraping bowl frequently. Stir in enough remaining flour to make dough easy to handle. Place dough on lightly floured surface; gently roll in flour to coat. Knead about 5 minutes or until dough is smooth and springy. Grease large bowl with shortening or spray with cooking spray. Place dough in bowl, turning dough to grease all sides. Cover bowl tightly with plastic wrap and refrigerate at least 8 hours but no longer than 5 days. Gently push fist into dough to deflate. Divide dough into 2 equal pieces for loaves or 4 equal pieces for rolls. Shape and bake as directed below. Cloverleaf Rolls: To make one batch, grease bottoms and sides of 8 to 10 regular-size muffin cups with shortening or cooking spray. Shape one-fourth of dough into 2-inch balls. Place 1 ball in each muffin cup. With kitchen scissors, snip each ball completely in half, then into fourths. Brush with softened butter. Cover and let rise in warm place about 1 hour or until dough has doubled in size. Heat oven to 400ºF. Bake 15 to 20 minutes. Makes 4 batches of 8 to 10 rolls. Why it Works: Adding mashed potatoes to yeast dough may seem unusual, but it does more than add flavor. Cooked potatoes are made up of mostly starch. This starch readily converts to sugar in the dough, which is hungrily eaten by the yeast. With this “jump start,” the yeast alters the flavor of the bread. 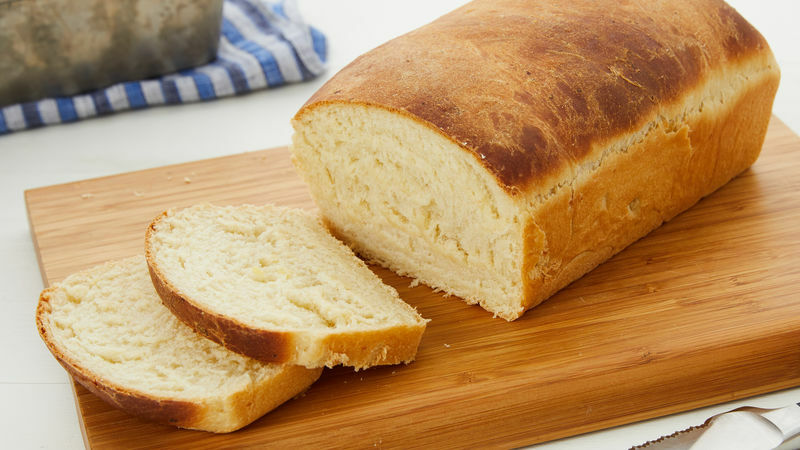 In addition, the extra potato starch in the bread holds moisture longer than bread made without potatoes. Bread made with mashed potatoes, then, lasts longer before going stale.